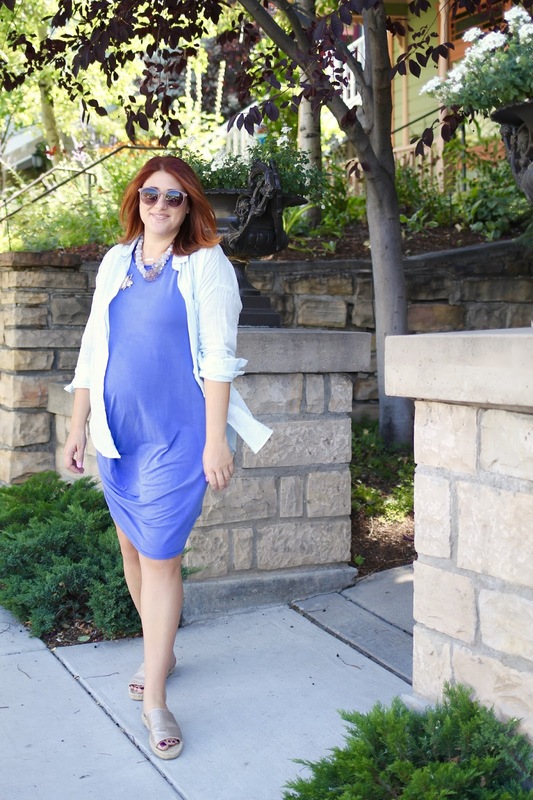 This Rachel Roy dress has been keeping me comfy and covered throughout this pregnancy. 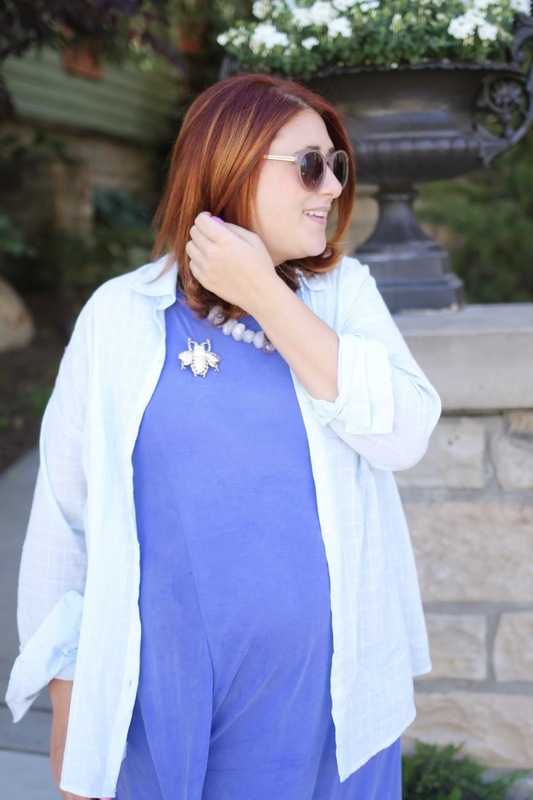 It's not maternity but has this gathered side that really works for accommodating the growing bump. It also comes in a bunch of colors but I'm partial to this shade of blue. Not to mention it's made of a silky cotton that makes it feel way fancier than it really is. 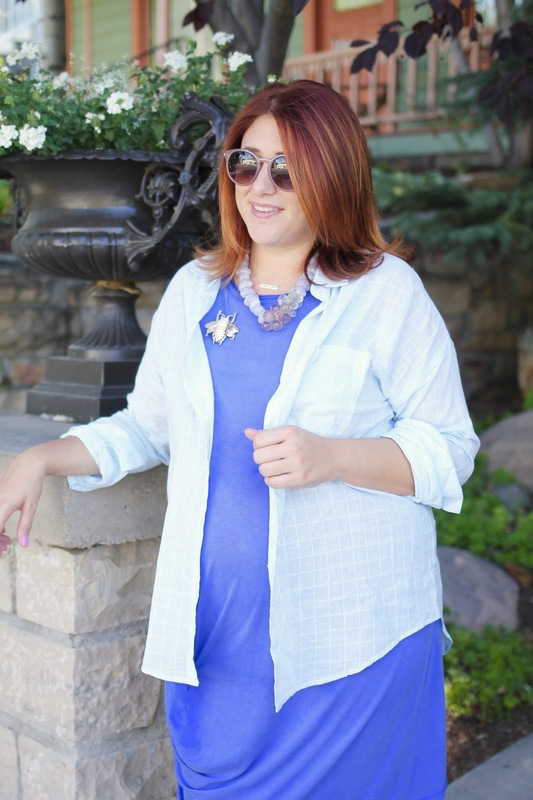 I wore it out to check out the Washington School House Hotel in Park City for a possible babymoon destination. While in Park City we made a quick stop in the J. Crew factory to stock up on some button-downs to prepare for the cold months ahead where I will need easy nursing options. I noticed that next door was a Motherhood Maternity outlet shop. I decided to check it out and ended up totally wishing I didn't. Let me tell you about an employee at a maternity store who may have been accidentally insulting pregnant women for her entire job. I sure know she insulted me, so I'm sure she's been doing it for a while now. So I found a pair of pajama pants on the clearance rack, and let's be real, that's pretty much the extent of my maternity pants needs at this point. For seven bucks, I'll grab a pair of comfy pants to sleep in. I took a pair of gray and then a full price pair of the same ones in black to the fitting room with me. I quickly realized I didn't care enough to spend $13 more on the darker color so I went with the $7 option. I walked up to the counter, and you know what the woman behind the register said? "Oh, did nothing else fit?" Seriously??? There are probably about 40 other ways she could have handled that, but she chose the most insulting way to greet me. Then, she continues to dig the hole a little deeper. "Well you look like you're about to pop any minute. When are you due?" Again, really? My response this time was a little more aggravated so I said "actually, I still have about two more months to go." I must say, if there is anywhere in all the land where some sensitivity training should take place, it's when you interact solely with pregnant women. We are quite the sensitive bunch, especially when you accidentally insult us. TWICE. I really don't think she meant to insult me but, jeez, the choices of words where like the worst ever. Tell me, am I being oversensitive or would you have wanted to punch this woman as well? She's an idiot! You look amazing, and she should choose her words more carefully. I think so too! Love ya, Kit! That's when you should have asked her when she was due 😜 Totally inappropriate. Yes, those are some pretty insensitive comments, especially coming from a woman who deals with pregnant women all day, but really anyone would be bothered by "did nothing else fit?"